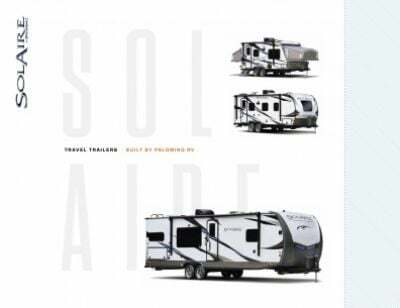 If the 2019 Palomino SolAire eXpandables 163X has caught your eye, stop into National RV Detroit in Belleville, Michigan and see it in person! National RV Detroit has been a top, full service RV dealership selling top quality brands at wholesale prices for years. Stop in and see us today at 44700 N I 94 Service Dr Belleville Michigan 48111 or give us a call at 734-439-3400 and our friendly knowledgeable staff will put you in this Hybrid Trailer at a dream price! Before you leave home, make sure to fill up the 50 gallon freshwater tank so that you'll have loads of clean, refreshing water for drinking, cleaning, and cooking on your trip! The kitchen comes equipped with a full set of modern cooking appliances, including the 8.00 cu. ft. refrigerator and the 3 burner range cooktop! Every great RV needs a great bathroom. The full bathroom features a roomy shower and an easy to use Foot Flush toilet! With 40 lbs. of LP tank capacity, you don't have to worry about losing heat for your showers! Dirty water and waste are stored in the 30 gallon gray water tank and the 30 gallon black water tank, respectively.